State or local tax authorities, and not the Federal government, usually collect property taxes on residential and commercial properties. However, these taxes are usually deductible on federal tax returns, with a few exceptions. For federal taxes, Internal Revenue Service (IRS) Tax Topic 503 says that state, foreign and local real property taxes are deductible. The IRS explains that these taxes are generally collected for public welfare use. However, these taxes are only deductible if they are uniformly charged at the same rate against all real property in a specific area. 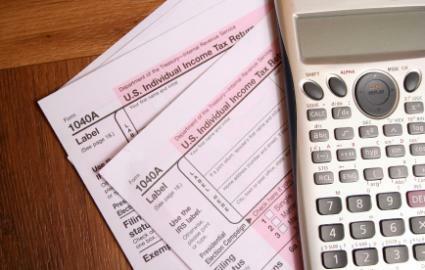 Deductions for residential property taxes are taken on Schedule A of Form 1040. Most states do not allow individual taxpayers to deduct all or a portion of paid real property taxes. However, some states allow taxpayers to claim a portion of paid real estate taxes as a credit or have a "homestead exemption" rule that provides residents with refunds on property taxes they paid. Under its Property Tax Credit, Illinois allows taxpayers to claim 5% of paid real property taxes on their principle residence on their state tax return. Kansas provides full-time state residents earning less than $32,900 per year a refund of up to $700 for paid real estate taxes. The resident must have also been born before 1958, been disabled, or have a dependent child living with them during the taxable year. Contact your state's department of taxation or department of revenue to determine if you can claim credit for all or a portion of your paid real property taxes or receive a refund. According to IRS publication 535, taxpayers can deduction federal, state, foreign, and local real property taxes that are charged against a business. Like personal real estate taxes, these taxes must be uniformly charged against all property in the area. However, you may not deduct taxes that are used to increase the value of your property, such as those collected for the installation of sewer lines or public parking facilities. Commercial real property taxes can only be deducted in the year in which they were paid. These taxes can be deducted either on Schedule C or Schedule C-EZ of Form 1040. States usually do not provide residents with a credit or deduction for taxes paid on commercial property. City or local assessments might be made if the city/local authority deems it necessary to add or improve sidewalks or thoroughfares, or to extend, install or replace utility lines. These assessments are often thought of as taxes, but the IRS does not allow taxpayers to deduct them. Rather, the assessments are added to the taxpayers basis (cost) in the property and recovered when the property is sold or disposed of. Transfer taxes and back-property taxes paid at closing on the purchase of a home are also not deductible- these taxes are also added to cost basis and recovered when the property is sold. Find out the rules for your particular state to find out what property taxes may be deductible and in what instances. For more information, contact a tax professional.